I decided I'd have an easier time adjusting to the missing finger if I was consuming wine while writing (after all, the old writer's adage is "write drunk, edit sober"), so on this beautiful, warm Spring day I pulled out a bottle of 15 year-old Pinot Gris from Alsace: the 1995 Clos Windsbuhl Pinot Gris from Zind-Humbrecht. In the end I didn't drink enough to even get a buzz, because this is the kind of wine you want to stay sober for! Those of you who are surprised that a Pinot Gris lasted this long, I hope you'll revise your thinking, as this is not uncommon from the great sites in Alsace. Clos Windsbuhl is a single vineyard in Alsace that, for a variety of reasons (which I'll spare you unless someone asks about it) yields wines that generally age well, and are often very tense when young. Since I was an insufferable newbie AND somehow also a know-it-all when I bought this wine back in 1997 (I was insecure and had a huge ego that was completely in the way of any sensory reception at the tasting I went to. To the extent that you care, we can thank maturity and my wife for feeding me the humble pie. ), I have absolutely no recollection of what this wine tasted like back then. However, based on my unusually broad knowledge (umm...where's that humble pie?) of Alsace wine, I imagine that there was some residual sugar that was prominent. If so, this is no longer a principal feature, but has absorbed into the wine as a whole. This is not uncommon in wines this powerful as they age. Think of it this way: this wine was made for a long life, so it's sweetness and acids were not communing very well early on, whereas in some of the very, very popular Chardonnays from Napa Valley and Sonoma Coast--those that many people think are actually dry--are made to co-mingle this sugar and acidity more precociously. A Pinot Gris like this would be a mind-bending alternative to fans of such wines. The Pinot Gris was fresh, didn't taste "old" at all, and had marvelously vivid stone fruit qualities to go with similar but significantly more suggestive aromas. It was hard to stop smelling this one. Zind-Humbrecht wines are not inexpensive, but this estate makes some of the greatest wines you can buy. I paid $45 for this wine (at a time when this kind of price made my head swim). That $45 has paid huge dividends for me so far, and I don't doubt that it will continue to do so for the rest of the day (and tomorrow). Strangely, these wines are not as in-demand as they should be. I've known many people who buy those aforementioned Chardonnays--which shall go unnamed (to protect the innocent, since this article is not meant to deride them...maybe I'll write one of those later)--by the case and put them in their cellar, but then they don't drink them all within three years. Naturally they complain that the wines don't taste like they did or--my favorite descriptor--"should." I can only offer commiseration and a new buying strategy. The Clos Windsbuld Pinot Gris currently sells for about $65, equivalent to many of those California Chards, but this wine has no trouble lasting 15 years. Is it any wonder I still can't fathom the relative stagnance of Alsace wine sales at the upper end? Oh well, I'll just go back to my glass and enjoy it. If I can't get other people to buy these wines, then that'll just leave more for me. But I like sharing, so I'm afraid you'll be in for a continued assault. It's time to clean our basement. It is a naturally cool space that is conveniently damp thanks to the hydrostatic pressure applied by the hillside that rises behind our house, so naturally I have stashed my wine there. I have a fair amount of wine, some of which is neatly stored in racks. The rest of it is stacked rather haphazardly in front of the racks, which is sort of impractical, but there's precious little space to choose from, so there they sit. This is, of course, the problem. The state of our basement--for which my wife (wisely) refuses to take responsibility--has become a 'situation' because I couldn't find the wine that I wanted to have with dinner. This is not the first time this has happened, but the results were certainly the most outré. I had just served linguine with a Gorgonzola cream sauce with peas and figs, and my wife said to me, "It seems like we should have a bottle of white wine with this." Oooh!!! Throwing down the gauntlet! Of course I was embarrassed that I hadn't thought of this, so I headed for the basement to try to regain my dignity. I wanted a Viognier, but the challenge was finding one. I thought I knew where the Viogniers lived, but after digging through 12 cases of assorted wines (food's getting cold! ), the only thing I could actually lay my hands on that seemed appropriate was Alsatian Pinot Gris. Despite being the biggest enthusiast of Alsatian wine I know, I just didn't want that (I have had LOTS of it recently...). So I went with a Chardonnay, which might have been okay had it been a Monterey Chard with a butterscotch thing going on flavor-wise, but no...it was Chablis. Even if You Believe Hard Enough, You're No Less Wrong than "We'll Be Welcomed as Liberators"
It was a bottle of Verget 2004 Chablis. This was wrong. I knew it was wrong. Chablis would never have occurred to me under any other circumstance. Chablis is, by nature, tensile and minerally, which was not right for the Gorgonzola cream. But I suspended my own disbelief and sought some credible way of shoehorning the choice into place by rationalizing that the Jean-Marie Guffens (the man behind Verget) treatment (which yields a cool creaminess) would help it out. Any help this style of wine making may have made was negated by vivid clarity brought by the 2004 vintage, which energized most white Burgundies beautifully (the reds have not fared so well). It was delicious wine, no question, and it didn't ruin the food, but it didn't really work, either. It became a little black peppery, which was not the flavor I was seeking. My wife put it well: "It's on the edge of clashing, but it still makes my mouth water." Yes indeed--perfect description. A Viognier, on the other hand, would have really been lovely, and when I finally found one the next day, it provided a delicious lift to the leftovers. ...I Meant to Do that! Coincidentally AND ironically, the Chablis was a success with our dessert: we had M&M Bars that I made with my children (essentially Toll House pan cookies made with M&Ms instead). The moment I took a bite, I knew that the Chablis would work, and it was indeed an extraordinary companion. Ha! Redeemed right at the end! . I just yanked a 2002 of this out of my cellar, opened it and wanted to scream for joy, but my kids were asleep, which doesn't happen easily, so I just went outside and whooped around, pretending the Braves had actually won the World Series. Its flavors were so vivid and potent that I couldn't have been happier (obviously). The aromas alone were unique and heavenly enough to seduce me--almonds and lavender--but it had a bit of fennel emerging when I tasted it, making it seem at once possessed by the freshness of youth and the wisdom of the ages. This blend of Pinot Gris, Pinot Blanc, and Aligoté (!) from California's Central Coast is a unique wine to be sure, and it comes in the single heaviest bottle I have ever held, but it cried out to be drunk with the Thanksgiving feast! One among many I will be drinking (I have a hard time stopping at one, but I don't suggest that everyone take my approach!). Run, don't walk, to your local retailer (or call them--if they don't have it they can probably order it in by Thanksgiving) and get the current release, which should be the 2004--an amazing vintage of the wine. It's not inexpensive (in the mid-$30s, as I recall), but it is an extraordinarily special wine. And if you are lucky enough to find an older vintage (it matures beautifully--see below), don't hesitate to grab it! A friend brought me the 1999 Hildegard recently and it absolutely made my WEEK! Its original release date was September 11, 2001, but that suddenly seemed a frivolous thing, I am sure, and they forgot eventually about it. It's available now at the winery, and may be available in the marketplace, if enough people ask for it. I cannot express fully the import of good glassware for wine, because you'd realize that you would rather be a test subject in the NIH Toe Stubbing study than read on. But this website is, in part, about getting "more from your glass" (see above), so breathe easy--and read on! You may think this some bit of snobbery, but I assure you, it is not. Wine deserves good glassware. 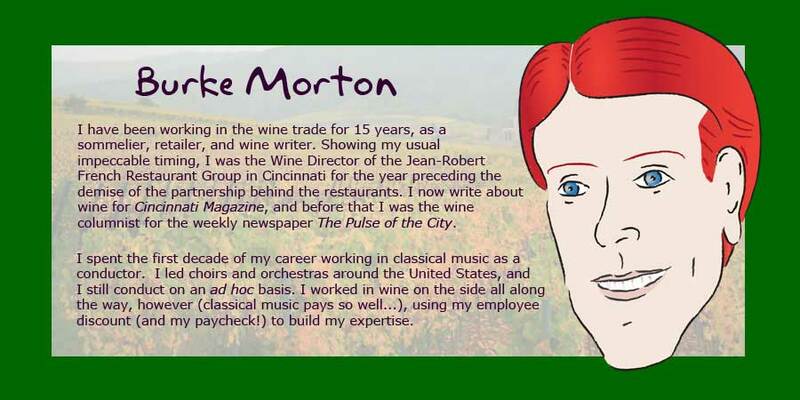 This is hardly an original position: I'm just another in a myriad of voices adjuring wine lovers to graduate up. Clearly this is catching on, though, as the 99¢ glass from your local mass-merchandiser has become sufficiently insufficient that Target now carries Riedel crystal stemware in several shapes. If you drink a wide variety of wines, it is worth investing in more than one glass shape. I have four that I use with regularity: two of these stem shapes are excellent "all-purpose" glasses; two are key for making some wines better, and if you drink the wines suggested below, they will be come important glasses to you, too. Whites: Chardonnays of a majestic style (i.e., White Burgundy and the like), Viognier is lovely from this glass as well. Reds: Pinot Noir, Nebbiolo, Grenache, Beaujolais (Gamay), Pinot Meunier, Counoise, among others. The Bordeaux glass from Riedel's Vinum series is a very aggressive glass that is designed to tear through tannic structure so that one can appreciate the wine faster than having to let the wine mature for several years. Wines that perform well from this glass are, as a rule, youthful reds: Bordeaux; Cabernet Sauvignon; Syrah; Merlot; some more strident Cabernets Franc; some stiffer kinds of Malbec; Mourvèdre; gripping, young Tempranillo. I've never enjoyed using this glass for white wine--the wine becomes too diffuse. What does this have to do with Wine & Food Pairing? Wines chosen for specific foods are, one hopes, selected to enhance the way a diner experiences the flavors within a dish, as well as between the food and wine. If you really intend to capitalize on this (and if you love food, I suspect you'd agree that one should do this), the way a diner perceives the wine should not be inhibited the glass. Some of this sounds fussy, I know, but it really isn't much trouble, and it can make a huge difference. If one goes to the trouble of getting a good companion wine for their food, then--unless financial considerations preclude the purchase of new glassware--it would be a shame to be half-assed about its presentation. As far as good values go, and I'm all for good values where something as fragile as a wine glass is concerned, you might also try Riedel's 'O' series, stemless tumblers (great glasses that also do fine in the dishwasher) that are inexpensive and come in bargain-priced sets. If it turns out that you were wronged in a previous life by a Riedel ancestor, or if you simply want to try something different, you might try Spiegelau, another excellent crystal company whose stemware I own and admire (it's just less easy to get). I shouldn't forget another crystal maker I'm partial to, as well: Schott Zwiesel makes some wonderful, sturdy glasses out of titanium crystal, which I have used in a restaurant setting with excellent results.